No Work and All Play: Throw a Labor Day Casino Party! Want to kick up your Labor Day’s BBQ up a few notches? Why not transform it into a glitzy casino party to celebrate a year’s worth of hard work! Let’s be honest here, you deserve it! Why? Because I know that you love gambling and you deserve some down time with your friends and family, especially on Labor Day weekend! It’s the time to relax and chill out! In fact, do not even worry about hiring dealers; we have that covered in Silver Oak Casino. All you need is a couple of computers and we will do the dealing for you! 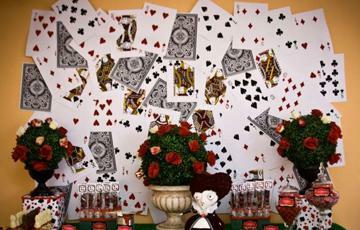 Check out these fresh casino party ideas that we have prepared for you! You deserve to rest on Labor Day weekend, so we won’t give your ideas that will have you sitting down for hours cutting and pasting spades, diamonds, or hearts. Instead, we have found the coolest and cheapest deals so you can have your decorations ready with a click of the mouse. The folks at Party City have some really cool looking casino decorations, plates, etc., so you can give the casino feel to all. Plus, on Amazon, you can find over sized card decks that can help you decorate walls or you can buy sets of cheap card decks too to help you with the silverware decorations. For example, if you punch a hole in a card, it can work like a wine class marker or, you can use paste individual cards on red napkins as decoration and use them to help you wrapped utensils and the like! Besides the traditional barbeque, we have come up with some fun Casino theme desserts that can really brighten up the day. Instead of baking the traditional Ace-card shaped cake or round shaped poker chip cake, how about getting the little ones involved and have them decorate cupcakes for every guest? They can help cutting fondant pieces and placing them in the frosting! Simply by using this set of Hold’Em Cookie cutters, the food decorations are complete! If you think buying cupcakes is a hassle, you could also decorate cookies! You could even use these cutters to make fun decorated sandwiches or roll-ups! Roulette roll-ups anyone? Silver Oak Casino provides the entertainment! Roulette or Craps: Being games that are purely governed by chance, we imagine your guests will crowd around the screens to place bets on where the ball will fall or the dice will roll! Have fun snacks close to the screens like red and black M&Ms or licorice! Casino Theme Slots: Slot Machines like Haunted Opera, Mice Dice, Big Shot and Crazy Vegas really give the right feel to put you in the Vegas mood! Or if you want to go with a more classic slot feel, the Three Stooges machine is a staple of casinos everywhere! If you want our advice, the main event of the BBQ has to be a friendly poker game with your friends! Plus, you can bet a couple of real bucks to make things more interesting! If you don’t have one already, you can get an inexpensive poker set like this one and set a poker table! We can guarantee you that all your friends will have fun and it would be a great way to close the night!